The dreaded chore of laundry can feel like a slog. Folding takes forever, drying clothes requires so much space — and everything's worse if your laundry room is ill-equipped. Luckily, upgrading your space doesn't have to mean a major renovation. Whether you want to hide your extra supplies, tuck away your drying rack, keep track of loose change, or just make laundry day more fun, these 10 easy hacks promise to make a huge difference in your weekly routine. 1. Build a pull-down drying rack. Are you handy with a drill? This beadboard drying rack is easy to make (just follow the instructions at The House of Wood). 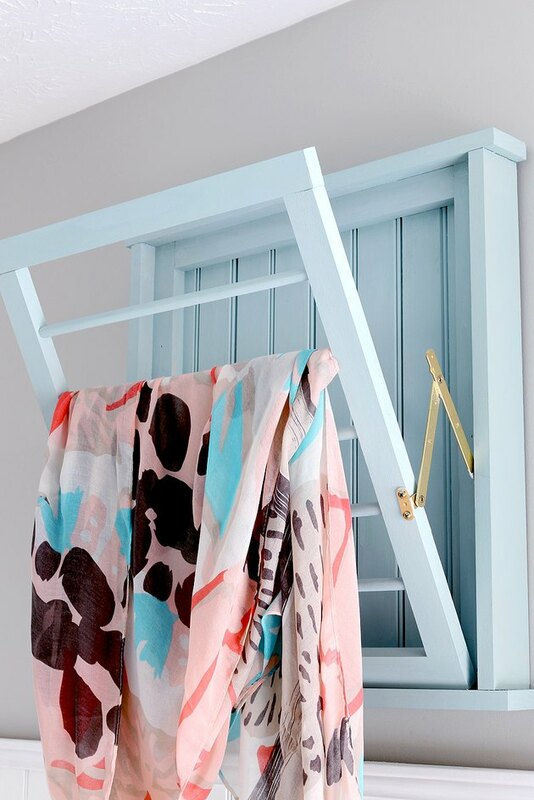 Paint it a stand-out shade to add some color to your laundry room. 2. Hang laundry sorting bags. Save yourself a little time and the headache of having to separate your lights from your darks every time you go to do laundry. Follow the blog Yellow Brick Home's lead and install this clever DIY sorting system. With a couple of canvas bags, a few hooks, and a little elbow grease, you can watch as the laundry basically sorts itself. 3. Put your hamper on wheels. If carrying your laundry to the washer is more like an ab and bicep workout, consider wheels. 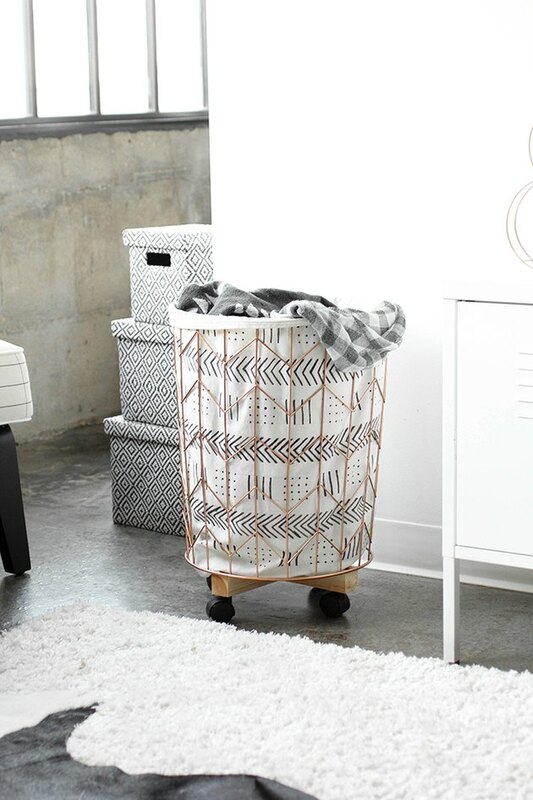 Install rolling casters on the bottom of a wire bin by following this easy DIY project from I Spy DIY. And voilà: a cover-up for your two-week-old pile of laundry and an easy way to truck those clothes across the house. 4. Mount your most-needed supplies. 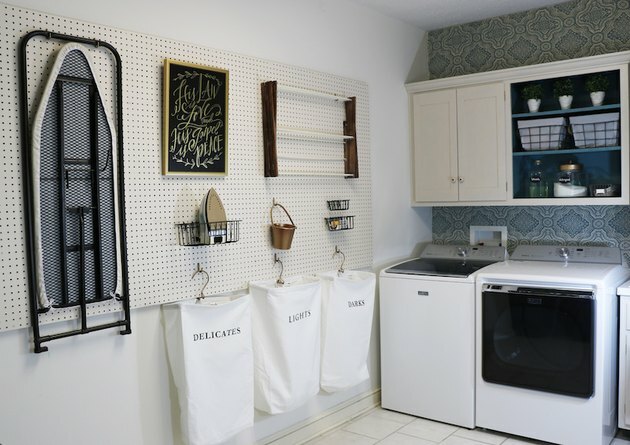 The laundry room feels like the junk room of the home: it's where you toss everything from extra lightbulbs to back-up linens to cleaning supplies. Get your miscellany in order with this clever utility pegboard from Remodelaholic. 5. Dress up your detergent. Detergent bottles aren't always the prettiest, but shoving them in a drawer isn't the most efficient option. 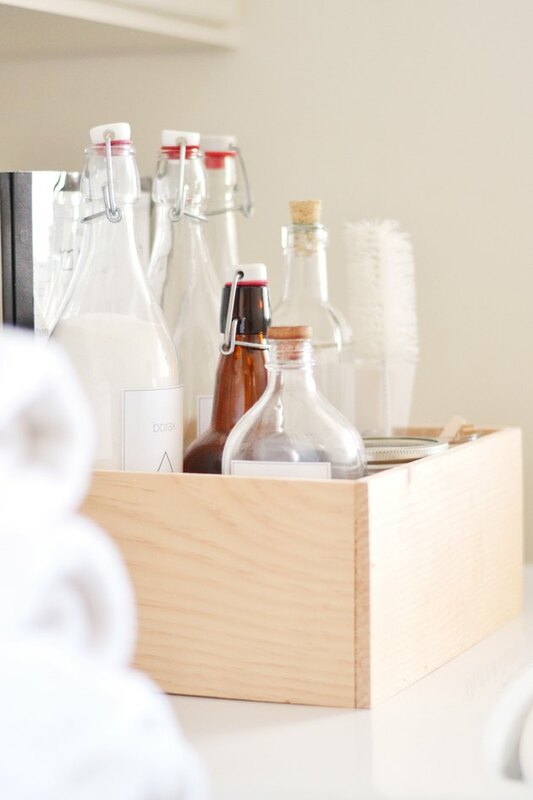 Show off your laundry soap, bleach, and the like by storing them in clear beverage bottles. Check out how Chloe from the blog Boxwood Avenue dressed up her laundry bottles. And bonus: She even has adorable free printable labels that you can use to stay organized. 6. Transform old plumbing pipes. 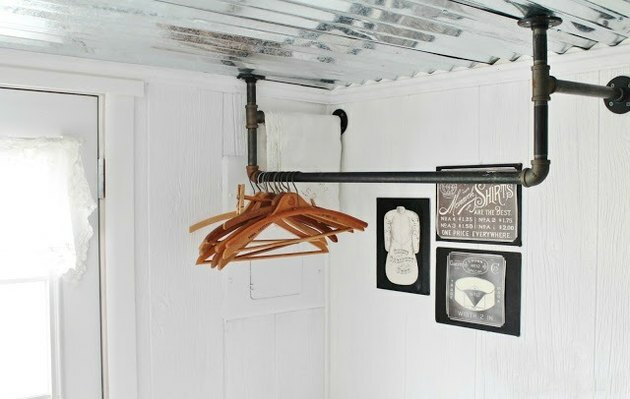 Continue your industrial style in your laundry room by turning vintage plumbing pipes into a clothes rack. Cast iron makes a pretty pairing with crisp white walls — and is sturdy enough to support the weight of heavy, wet clothes. 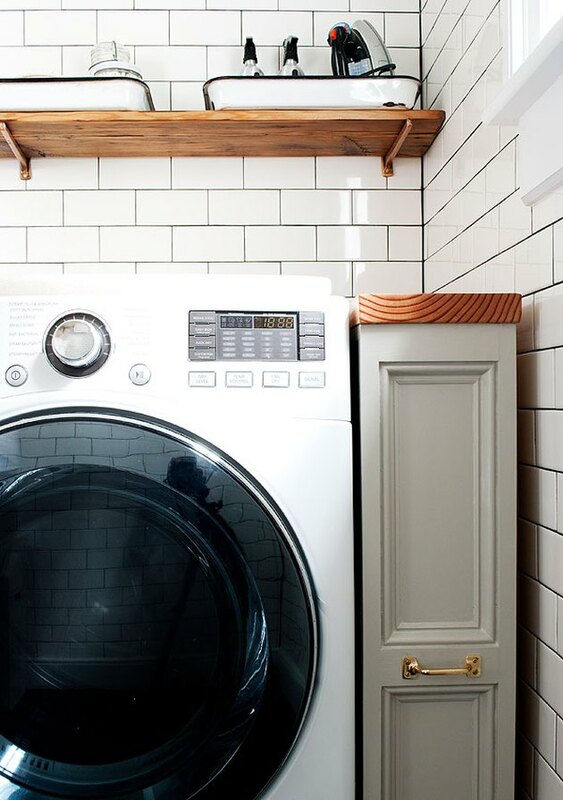 Take advantage of that pesky space between your washer and dryer by building your own storage. 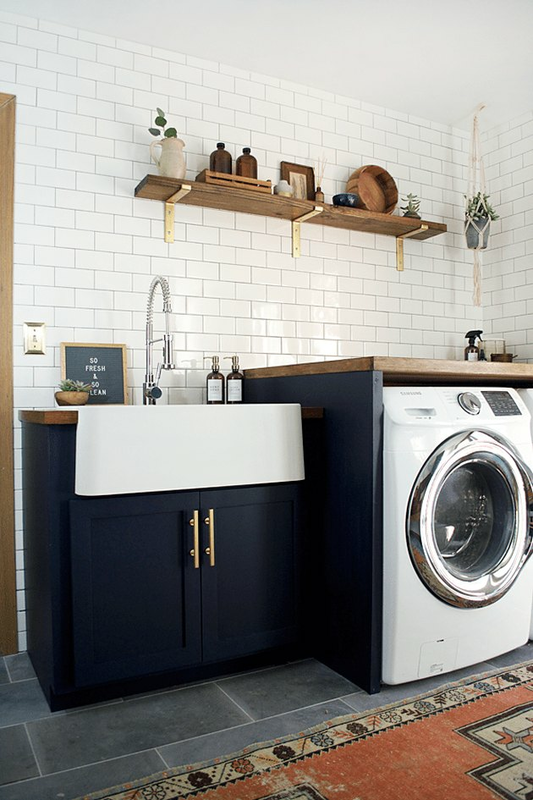 Follow these instructions from the blog Manhattan Nest to add extra storage for bits and bobs — and make your laundry room look ten times neater. 8. Hang your ironing board. Ah, the pesky ironing board. So necessary — and so stinkin' hard to store. 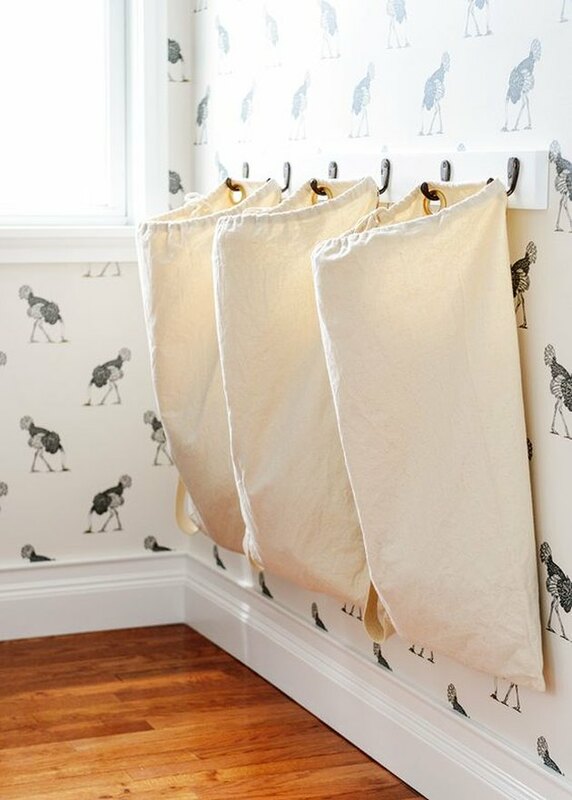 Give the board its own hiding spot by wrapping a two-by-four in burlap and adding pretty hooks. Follow these instructions at The Wood Grain Cottage for more details. Finders should be keepers when it comes to forgotten coins that run through the laundry — but most children seem to disagree. 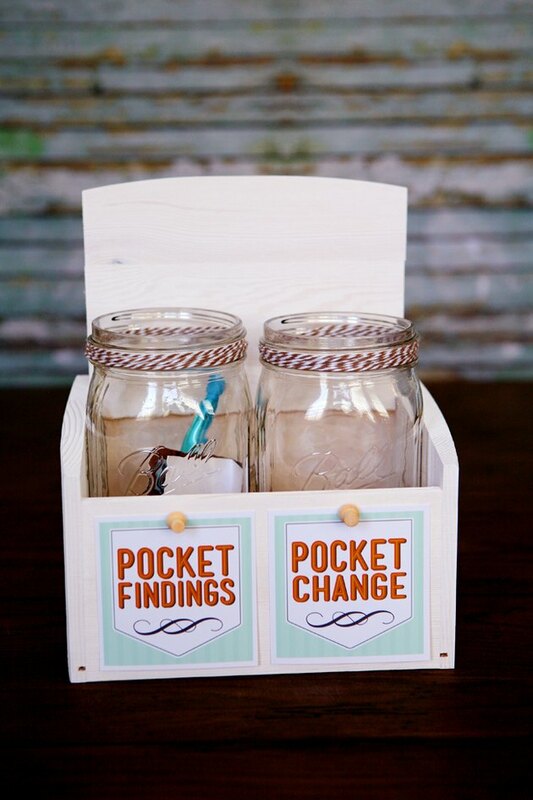 Plunk any spare quarters and stray Chapsticks in Mason jars. (Find the printables at Eighteen25). 10. Decipher the secret to bright, vibrant laundry. You spilled wine on your favorite shirt. Now what? No, you don't have to call your mom. 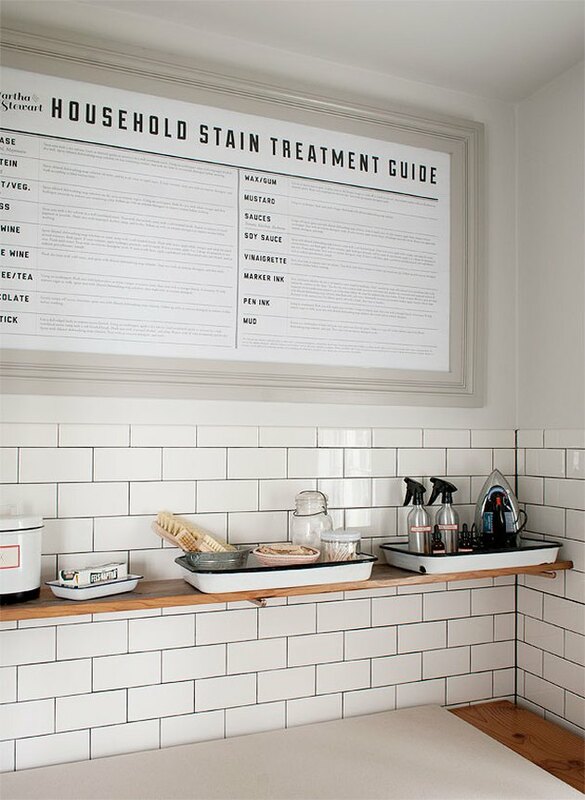 Just take a page out of Manhattan Nest's blog and hang a handy stain treatment chart. 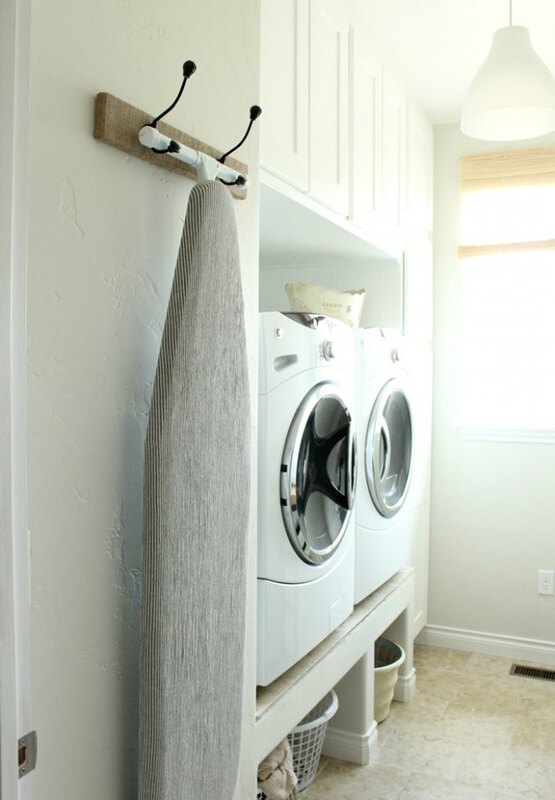 This easy DIY project will make laundry time a little easier and will make your colors brighter and your whites whiter.